Politburo Standing Committee member with a long career in Qinghai (which encompasses large parts of Tibet). Education: Joined the CPC in 1975 as a student of philosophy at Beijing University. Career: Past career was largely in Qinghai Province, where he rose to Party Secretary 2003 – 2007. 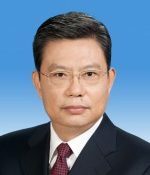 Party Secretary of Shaanxi Province 2007 – 2012. Promoted to be Head of the influential Central Organization (personnel) Department in November 2012. Prospects: Promoted to the Politburo Standing Committee in 2017 and the Central Commission for Discipline Inspection. Also on the Central Committee Secretariat. Relevance to Tibet: Politburo Standing Committee member with work experience in an area of Tibet. Zhao Leji is the 6th ranked member of the 19th Politburo Standing Committee, and Secretary of the Central Commission on Discipline Inspection. As the former Head of the shadowy Central Organization Department, Zhao is likely to have worked closely with his predecessor, Wang Qishan, in implementing Xi Jinping’s anti-corruption campaign – also seen as a tool to eliminate political rivals and enemies – promoting loyal officials to replace those purged. According to the South China Morning Post, a former aide of Zhao Leji’s is among those investigated and expelled from the Party in August 2017, but this has not affected Zhao’s rise. As a relatively young Politburo Standing Committee member, he has a chance of staying on the PSC beyond 2022. Zhao Leji, born in Xining, the provincial capital of Qinghai Province, was “sent down” to the countryside at the age of 17. He later studied in Beijing and in 1980 returned to Qinghai where he served in various roles for the next 27 years. At 42 he was the youngest-ever official to attain the position of provincial Governor, and was subsequently Qinghai’s Party Secretary between 2003 and 2007. On his transfer to Shaanxi Party Secretary in 2007, Chinese state media described Zhao Leji as having been prominent in efforts to “combat foreign hostile forces, in particular, the 14th Dalai Clique’s infiltration and sabotage activities in Qinghai Province” (translation by International Campaign for Tibet). In 2012 Zhao Leji was promoted to the 18th Politburo and the Central Committee Secretariat, and took on the role of Head of the Central Organization Department, becoming the Communist Party’s Personnel chief. Zhao was widely expected to be lead the new National Supervisory Commission, created in March 2018, but this job went to Yang Xiaodu, previously Wang Qishan‘s deputy. Zhao Leji is nevertheless expected to work closely with both Vice President Wang and Yang to take Xi Jinping’s anti-corruption campaign to new heights. This entry was posted in Profiles and tagged China, Chinese Communist Party, Organisation Department, Politburo, Qinghai, State Council, Tibet, Zhao Leji. Bookmark the permalink.